Halloween is a holiday for kids. That's all there is to it. If you are over the age of 12, Halloween is not for you. If you're 13, maybe I'll give you a pass. But that's it. If you're out of the eighth grade, your costume days are over. I don't care how clever you think you are when you dress up as Hunter S. Thompson or put on blackface to be Tubbs from "Miami Vice" (something I swear to you I saw on the PATH train last year). Resist the temptation to dazzle your friends with your creativity and just treat October 31 (and all days around it) like any other day. The day is no longer for you. Be content with your Guitar Hero mastery and just let the kids have this one, OK? Of course, there is one important way you can celebrate if you live in a residential neighborhood. Or, in my case, are close enough to the residential neighborhood in which you grew up. Every year, I celebrate Halloween the only way I know how as an adult (let's pretend I'm one for the sake of this blog entry). I head back home to Staten Island the weekend before and stuff treat bags with a frequently obscene amount of candy. I don't mess around, people. 118 bags are now sitting in my childhood living room, waiting to bring joy to the children of Staten Island on Halloween (assuming the family dog has not consumed them). I worked out a system of equal distribution of chocolates and nonchocolates (the system fell apart at the end; the latecomers will have to deal). I overcame a preponderance of Milk Duds in a variety pack. I didn't graze any of the candy. I did it for the kids, because it's their day. And I remember the joy of treat bags that always made up for the people who gave out my least favorite candy, Whoppers, or, worse yet, nickels. Truth be told, the thought that my mom might give out nickels to kids also motivates me to put the bags together. So, celebrate Halloween by being good to your local trick-and-treaters. No nickels, please. With all the bleak reports in the news the last month, I knew it was coming, but Porter Wagoner's death at the age of 80 this weekend still leaves me cold this Monday morning. But it's comforting to know he had a solid final act, releasing the acclaimed "Wagonmaster" CD and opening for the White Stripes at Madison Square Garden this year. I only wish he'd had more time to enjoy it. ...for you to buy me a ticket to see Billy Ocean at BB King's Saturday night. Avoid the extra $4 charged for day of show sales and buy now! I'll write about it immediately afterward! Don't you feel guilty that T&R provides you with all this entertainment that you pay nothing for? Yeah, I've been trying to justify spending $50 (plus the $10 table minimum) on a Billy Ocean show, but I'm not sure it can be done, although some people seem to be able to, seeing as the show wasn't knocked down to half-price as BB King's sometimes does when ticket sales are slow. I was banking on that. I could have justified $25. Alas, I will have to continue enjoying Mr. Ocean on YouTube. And maybe position myself at BB King's for soundcheck Saturday afternoon. Tinsel and Rot continues its reputation as a sharp observer of musical trends among the youth of America by reporting on the shows T&R attended during this year's CMJ Music Marathon in NYC. Make that show. And it wasn't even linked to CMJ. Screw the youth of America. And, believe me, if I can get rid of this gut, I might just try. So, yeah, anyway, last week T&R went to the bastion of hip, cutting-edge music in New York City, BB King's Blues Club in Times Square, to see 83-year-old banjo legend Earl Scruggs. And, as an extra added bonus, I got a table of 40-year-old frat guys behind me talking almost nonstop for three hours. Awesome. There was an official opening act, too, but I may have enjoyed the table of talkers more. Uncle Monk consists of Claudia Tienan on guitar and frequently inaudible vocals and Tommy Erdelyi--better known as Tommy Ramone--on mandolin and vocals. I am hesitant to say anything bad about a Ramone, but this was my second time seeing Uncle Monk and, with any luck, should be my last. God bless the Ramones, but Uncle Monk's just not for me. Luckily, Earl Scruggs was a lot better and, even at such an advanced age, plays a damn good banjo. Sure, there are some missed notes every now and then and he's a little less nimble than he was in his prime, but I suspect I will be similarly less nimble in 53 years. Actually, I can't imagine being less nimble than I am right now. But check back in 53 years and we'll assess where I'm at. Scruggs was also helped by his ace band, with sons Randy and Gary on guitar and bass, respectively; Jennifer Kennedy Merideth on Dobro; Hoot Hester on fiddle; John Gardner on drums; and Bryan Sutton and Jon Randall on guitars. Everyone was pretty much spot on, with highlights too numerous to really mention. Sutton and Kennedy Merideth were particularly impressive on numbers like "Streamlined Cannonball" and "Foggy Mountain Rock," and the group's cover of Dylan's "You Aint Goin' Nowhere" was pretty damn cool, too. My favorite song of the night, however, was, oddly enough, when Earl switched off to the guitar and picked an initially tentative but ultimately tender version of the Carter Family's "You Are My Flower," which is up near the top of my all-time favorite songs. And that's why, when one of the yahoos from the table behind me started singing his own lyrics to the song, I came as close as I have ever come to turning around and making a scene. Particularly when he was replacing "You are my flower..." with "I am a redneck..." Let's call this one Rule 4a: when a performer announces that the band will be performing a Carter Family, you shut your stupid, Bud-swilling mouth and don't open it again until the song's over. I don't care if you see a fire. Fire'll wait three minutes. And if it winds up consuming you, at least you will have died hearing a Carter Family song. Luckily (though I'm not sure for whom...I can't imagine a fight would've gone my way), I was able to zone out the babble and enjoy the song and the rest of the show. It was my third time seeing Earl Scruggs and each time I wonder if it will be my last. I hope Earl has a bunch more in him...and that I get to see a couple. As a guy who wastes too much money on autographs of people who haven't been famous for several decades, I'm not exactly in a good position to mock people who spend great sums of cash at big money auctions. But, lucky for you, I will press on. Blogs are empowering!!! So, there were two articles about auctions in the newspaper today that got me to thinking. The first was about a globe that an American GI took from Adolf Hitler's residence after it was overtaken. An interesting item to be sure, and the story behind it caught my eye. But then I kept reading and saw that (a) it was estimated to fetch around $20,000 at the auction and (b) the auction also included a box of Hermann Goering's cigars. Now maybe you're a historian and the World War II era is of particular interest to you. So you like collecting stuff from that time period. And you see that globe and the box of Goering's cigars (estimate $2,000 to $3,000), throw down your dough, and, boo yaa, the items are yours. Where do you go from there? Do you display them, bring out your loot for conversation starters at parties? "Hey, George, what a neat looking globe! Looks real old." "Yeah, Hank, give it a spin." "Guess who used to own that?" "Oh, wow, you mean this is part of your WWII collection. Neat. Um, let's see, Omar Bradley?" "Ya heard me. Hitler. Awesome, huh? Wanna see my Goering cigars?" "I should be going now, George." Of course, the World War II era isn't everybody's favorite collecting focus. Maybe you're more into items with tangential ties to a murder rampage. And you can find that in the other newspaper article I read. In 1977, Yankee manager Billy Martin gave a jersey to a gentleman whose girlfriend was killed by the Son of Sam (the gentleman was shot in the head during the attack). And now, with no one to pass the jersey on to, the gentleman has decided to let an auction house sell off the jersey. It is expected to get about $30,000 (bids are currently up to $11,000). Again, an interesting story and all, but do you really want something like that around? Particularly at the price of $30,000. "Hey, cool Billy Martin jersey. Is that game-worn?" "Yeah. And he gave it to a guy who was shot in the head by the Son of Sam! And Son of Sam killed his girlfriend!" I bet all three items go for above the estimate. People with money are scary. What a relief not to have that problem. You can see more at the guy's YouTube site. Capping off another action-packed weekend that started with the Avett Brothers in Troy, NY, and continued with 16-time Grammy winner Jimmy Sturr and the Jimmy Sturr Orchestra in Hunter, NY, Tinsel and Rot headed to the Land of the Misfit Boys, aka the Chiller Theatre convention in Parsippany, NJ, on Sunday to load up on potential Holiday Greeting photos and spend too much money on autographs of people I admired when I was 12. Mission accomplished on both fronts. Who says I can't set a goal and reach it? I have experienced many exciting surprises in my years on this earth, but perhaps none greater than the one that awaited me when I turned on my computer Saturday night and checked the Chiller website to confirm directions. I saw a note on the main page saying that three guests had been added to the Guest List on Thursday. I had assumed that the Guest List was all firmed up, so I hadn't really checked in last week. I had my possibilities lined up, the money all spent in my head, and then that Saturday Web surf happened. In a flash, everything changed. The world was turned upside down. A miracle happened. Ernest Thomas, Danielle Spencer, and Haywood Nelson were added to the Guest List. And if you don't know that that's Raj, Dee, and Dwayne from "What's Happening!!" please leave now. Only a "Police Academy" reunion could have filled my heart with more joy. "So, that will be $20." [To Ernest] "OK, you owe this guy $80." "Whoa! Raj is in charge of the money. What are you guys doin'?" "Ah, c'mon, it's like a plot from da show! 'I used the money to go buy weed because I thought it was a good investment.' Ha!" And they had to laugh at stuff like that for three days. Hoo boy. I think I'd lose my patience two hours into the weekend. I kept my interaction to a minimum, though later on I regretted not bringing up the brilliance of "I be Raj. Which Doobie you be?" to Ernest. But perhaps it's for the best that I didn't. Can't imagine that conversation would have brought me a lot of pride. Still smarting from embarrassing myself in front of Randy "Cousin Eddie" Quaid by telling him that my family and I quote Cousin Eddie lines all the time. He seemed underwhelmed. Luckily, I stopped myself before yelling "Merry Christmas! Shitter was full!" 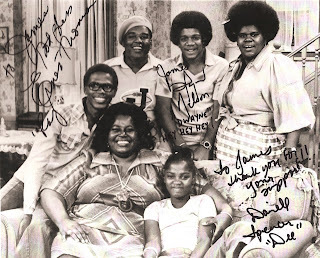 Anyway, I am quite proud to own the autographs of the surviving cast of "What's Happening!!" (or at least the main ones...I'm not counting that annoying white kid from the waning years...I assume he's alive, but I'm sure I don't care. Stick it, Little Earl.). Plus, I got the photo with the crew. Unfortunately for you, that photo is embargoed until the holidays. Be nice to me and I'll put you on the Holiday Greeting list, though I offer no guarantees that the "What's Happening!!" crew will make the cut. Been a good few months for the celebrity photos. Another photo in the same situation is one of the legendary Gary Coleman and me, who, as you can see above, clearly had the best price list of the day. As any "Surreal Life" watcher will know, Mr. Coleman doesn't care much for the "Whatchutalkinbout Willis" phrase. But apparently, money (specifically $60) talks. Or at least writes. I wonder if anyone took the plunge. And, no, wiseguy, I didn't. But I do now have a "Diff'rent Strokes" DVD signed by Todd Bridges, Charlotte Rae, and Gary Coleman. What have you done with your life? Once I spent the bulk of my budgeted money on the stars of the Channel 5 5 p.m. Power Hour of the Late 1980s, I had to be a little more selective. You won't find a much bigger fan of the first season of "Who Wants To Be a Superhero?" than me, but I'll be damned if I'll pay $15 to take a picture with first-season winner Feedback. Even if some of the money goes to Make-A-Wish. In fact, I want a monetary breakdown in situations like that. No more "a portion goes to." I'm gonna have to see who gets what. Just the way it is. No more hiding behind charities, particularly if you're the star of a reality show that most people don't even know exists. Feedback was in a room that was largely empty on Sunday, a few feet away from former Intercontinental champion Tito Santana and a little ways down from Ray Parker Jr., who had an iPod hooked up to a speaker and playing--guess what?--the "Ghostbusters" theme throughout the day. That room also featured former "Baywatch" cast members (Anjelica Bridges, Traci Bingham, and Brande Roderick) and female wrestlers (Dawn Marie, Gail Kim, and Christy Hemme), most of whom were surprisingly not busy most of the day. Apparently, the male attendees of Chiller are not as horny as I expected them to be. Actually, most of the guests (except the perpetually sunglassed Val Kilmer) were not exactly besieged with fans on Sunday, generally the slowest of the three days, which is the exact reason why I was there. I guess there's something to be said for the general chaos of Saturday, but, well, I'm not saying it. Unfortunately, it's harder to take surreptitious photos of guests on Sunday, so those are in short supply this time around. You'll have to make do with these shots of Martin "John Kreese" Kove and Butch "Eddie Munster" Patrick, the latter of which was taken as I was waiting for the shuttle to take me back to the train station. I just wanted you to see his hair. All in all, another fine day in New Jersey. Danny Bonaduce reinserts himself in the race for Greatest Reality TV Participant Ever (Celebrity Division) with this totally awesome flip of the ridiculously annoying Johnny Fairplay (from "Survivor" and, most recently,"Ty Murray's Celebrity Bull Riding Challenge") at the Fox Reality Channel's "Reality Remix Really Awards" (to air 10/13 . . . set your TiVOs). Mr. Fairplay says the face plant resulted in two-and-a-half hours of dental surgery and three root canals, and he has filed a police report about the incident. Bonaduce . . . back with a vengeance. *The return of "Curb Your Enthusiasm"